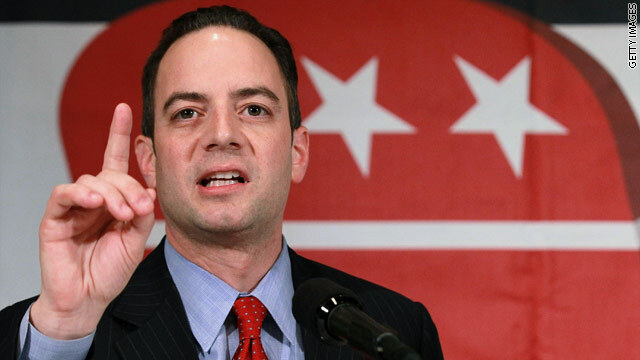 Washington (CNN) – Chairman of the Republican National Committee Reince Priebus attempted to pivot the political conversation Thursday from President Barack Obama's birth certificate to the president's policies. "We're borrowing four and half billion dollars a day and this president is more worried about birth certificates, Oprah Winfrey and fundraisers at the Waldorf Astoria," Priebus said on "CNN Newsroom." "It's maddening and I just wish the president would engage in the real issues that are affecting America." Obama released the long-form version of his birth certificate Wednesday, seeing to put an end to persistent rumors that he was not born in the United States. He said the country was focusing on the "silly" debate instead of the country's economic obstacles. But Priebus said it's the president's priorities that are out of whack. "We've got a president who's not talking about the issue," Priebus said. "We've got him going to Jonas Brothers, golfing, doing everything except figuring out a way to save Medicare that's going to go bankrupt in nine years." Although he said he has been a steadfast opponent of the so-called "birther" movement, the newly elected chairman told CNN's Carol Costello that it's not his job to dictate topics to potential 2012 presidential candidates. For the past two months real estate mogul and possible GOP White House contender Donald Trump has frequently questioned whether the president was born in the U.S.
"It's not my job to play police officer with the candidates," Priebus said. "It's up to the voters to play police officer and go into the voting booth." Um, Reince I think it was your party that perpetuated the birther myth. BTW it was also your party that insisted on tax cuts that went to the wealthiest Americans in 2001 and 2003 that took us from Clinton's surpluses to deficit mode ever since. It was also your party that presided over the near meltdown of the economy and, oh yes, it was your President who left office losing us 700,000 jobs a month. Got memory? (milk mustache reference....never mind). OK so now were're getting into somewhat of a discussion about jobs. The republicans have a single cure for creating new jobs – cut taxes. What a great idea – if it would work. I know several "millionaires" and I can tell you that they have no interest in creating jobs because they're not captains of industry – they're just regular folks who have done very well for themselves and want to keep their wealth and have no interest in producing anything. If you've got a great idea for a start-up company or want to expand a thriving business – money is available and tax cuts for the wealthy have nothing to do with jobs. Seriously? The empty rhetoric from the GOP is getting disgusting. You people perpetuated this birther garbage and now after you all look like drooling idiots, you want to change the subject. It's getting sickening and you people are nothing more than a bunch of children who can't accept any responsibility for your actions. As far as fiscal issues are concerned, the GOP invented deficits and none of you twits who are screaming from the rooftops said a thing when Reagan and both Bushes were wiping out our economy. Just shut up. oh come on...do these republicans have any sense of shame? after their ranks have been demonstrated to believe this garbage about the prez not being born here over and over NOW they say this is a distraction. Well, duh it was a distraction when they were feeding off of it a week ago too. The GOP reminds me of a group of arsonists that start fires all around town, cut off all the water to the city, then get hired as firemen and complain, scream and shout about how bad the fire department is at doing their job! The GOP over an eight year period distroyed America, blamed the Democrats, got voted into office, and screamed about how bad the government is. ONLY IN AMERICA CAN THIS HAPPEN! I'm sure it makes Reince very happy then to hear that we here in Wisconsin will be policing the State Senate very soon. Nine State senators up for recall so far, six of them Republicans. The people will be heard. Typical GOP/Tea Party dirty swift boating tricks of tossing lies at your opponents and then criticizing your victims for defending themselves. The needless diversions by Trump and the Birthers only distract the public's attention away from the GOP messages on the budget, economy, and health care. Maybe the GOP/Tea Party wants the diversion because it cannot defend their budget proposal to cut taxes for the rich and make reduced Medicare benefits more costly for seniors? Perhaps if Prebuis and other prominent GOPers HAD policed their own lies and backstabbing against our President ... he wouldn't have to spend so much time defending himself against their lies and backstabbing. I live in a rural very republican area of Illinois. today at the post office the morning group of normally against the president was talking about how stupid the republican party has gotten. They were saying that the republicans can't seem to find a thing our president does right even though they can see it.They said there is not a candidate on that side they can vote for. This coming from died in the wool republicans. if trumps ears weren't on fire they should have been after that session! They were also commenting on how disrepectful it is act the way they do toward a sitting president. this a a crowd of voters that range in age from early 20's to late 70's. Wonder if the republicans will figure out they are losing ground with their loonies and slashing things people need and giving to the wealthy. "It's maddening and I just wish the president would engage in the real issues that are affecting America." Really? Cause the last a read he was going to push for tax reform to reduce our debt by 1 trillion dollars a year. Also, if he wouldn't get so much resistance from republicans we would be making policy changes that ARE effecting america. Democrats had to compromise in order to get health-care reform thanks to republicans. Now we don't have a universal health care system like Canada. If they can do it there is no reason that we can't. Oh, except that reblicans and corporate lobbiests are are trying to stop it. This is the first president I can even remember that is attempting to make changes to something that really is effecting americans. (Not just the wealthy) You are whining about us borrowing all that money but Republicans would not even work with the Democrats unless the George Bush era tax breaks are kept in place. And how much is it costing us to give these tax breaks to the wealthy? How much money would we not have to borrow if we made the rich pay thier fair share. I sincerely hope that people in this country aren't stupid enough to buy this crap, but I know I'm wrong. This is a perfect example of why this country is lagging behind so many other nations. People here are simply getting dumber by the minute. The Republican Party drove the U.S. economy into a ditch, and now they are driving themselves into a ditch. Reince Priebus?? Sounds like some cartoon character.I guess if the shoe fits.Also,that doesn't sound like a good old American name.Can we see your birth certificate please? Mr. Priebus it is the GOP/TEA who has kept this rehtoric in the news. And yes we borrow 4.5 billion a day to pay for two wars that your party did nothing to pay for other than borrow money from China. No War Bonds or attempts to cut defense, but you did sign into law the Bush Jobs bill of 2001, 2003, 2006 and renewed in 2010. Yes they are also known as the Bush Tax Cuts. Your job is to spin the news but lets be honest about who got us here in the first place: GOP/TEA. The PRESIDENT is more worried about the birth certificate,....? He ignored the damn non-issue for well over 2 years after having satisfied all the legal requirements for eligibility to the satisfaction of the election commission, the GOP, the DNC, the CIA and everyone who frankly MATTERED in the context of that specific question,... before the nutbars finally found someone with enough visibility (not proportional to amount of brains) to make it a serious time-waster for people who are SUPPOSED to be involved in the process of lawmaking, so he finally took a few minutes and tried to put it to rest. How else should he have done that at this point? And now a third of the birthers are whining that he ignored it too long, another third are whining that they still aren't convinced, and the remaining backwash are muttering to themselves, fidgeting around and thinking about emerging from their parents' basement. If the GOP were looking for fatuousness and tin-eared obtuseness in a new spokesperson, they've done well. So, the whiney Republicans cahnt in unison that BO was not born in the USA – he gives the wingnuts the proof and now they're upste b/c he showed his birth certificate to them? LOL! What rational person would think these yahoos are fit to serve our country?